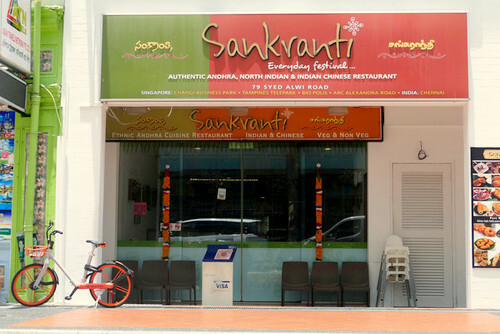 Sankranti Indian restaurant has a total of five locations in Singapore, one of which is at 79 Syed Alwi Road. Founded in 2008, Sankranti provides a menu full of authentic Andhra and North Indian cuisine dishes. Sankranti, where the name is derived from the Indian Harvest Festival of Sankranti which is celebrated across India to mark the end of the Winter Solstice and the start of Spring, also has outlets in Malaysia and India. …Egg Dum Biryani, Tandoori Aloo (potato marinated with Tandoori spices grilled in tandoor), Keema Naan (naan stuffed with mutton keema), as well as Mushroom Cheese Kebab (mushroom stuffed with grated cheese and spices). The official Sankranti Restaurant Facebook page is available at www.facebook.com/SankrantiRestaurant/. Following the Facebook page, you’ll receive updates about the restaurant’s menu items, their promotional offers, events, and more.